Note that the lightness at the front of the foot, the left of the picture, is light reflecting from the sheen of the graphite. I completed this drawing in the twelfth hour of my thousand-hour 2012 art challenge. It is taken from Plate I 13 from Bargue's drawing course, and it is the most intricate (and difficult) study I have done for a long time. I used a piece of card held up flat to the reference image to measure distances between points, which I then enlarged on another piece of card to plot the points for my drawing. 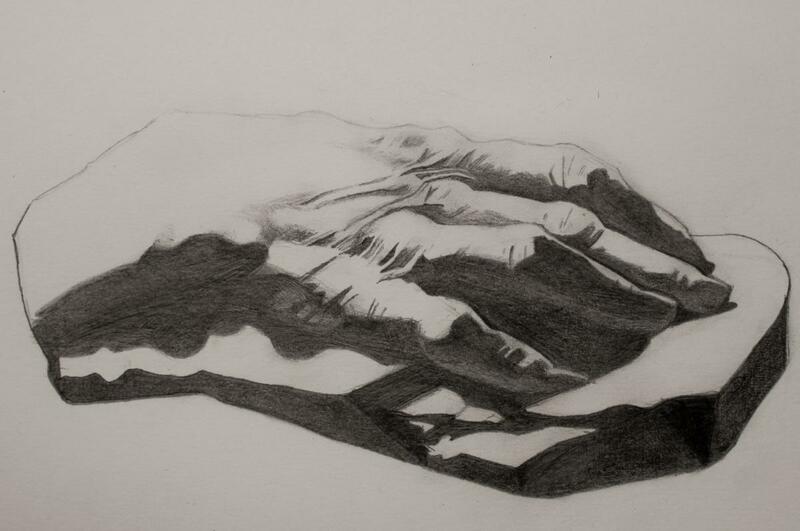 I used a lot of 2H for the shading of this, which rather over-worked the paper on the left-hand side of the hand's shadow, causing it to become uneven and worn. This is quite a poor photo of the sketch; the paper is white in reality! To map the line lengths and angles for this drawing I held up a pencil in front of the reference image, indicating with my thumb a measured length on the pencil which I then compared to another part of the reference image. I mapped these proportions to my own drawing by using a pencil to compare the relative angles of the lines I had drawn with the expected ones I had just observed. I didn't keep the distance of the measurement pencil from the reference plate constant when making these measurements, and nor did I maintain a consistent eye-level. This is exactly what the text of the drawing course advises against, because it undermines any attempts to accurately gauge angles and lengths! This lack of rigour in capturing the basic relations of the drawing has caused this attempt to be quite badly distorted. The lower half of the breast section is stretched vertically, and the left-hand bulge is over-emphasised. The angle of the second finger is wrong; it should pull back upwards rather than sheer downwards. My first attempt at this plate, which I didn't finish due to the inaccuracies. This is the second attempt I made at drawing this plate, having mucked up the proportions on the first go.